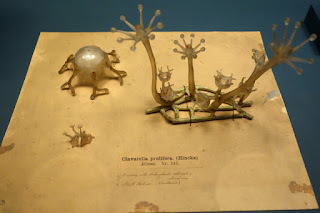 Hyperalleric invites us on a field-trip that they’ve helped to curate themselves to the Corning Glass Museum to marvel at the exhibit of antique glass models of deep sea creatures—tube worms, squid, corals and anemones—crafted in a nineteenth century workshop in Dresden from the stacks and storerooms of Cornell University, having acquired a sizable amount of them in the late 1800s for instruction in marine biology. The glass-workers were quite skilled and came from a long line of artists, and in response to wide-spread interest in natural history at the time, turned their attention away from jewelry (though having gotten quite talented at making glass eyes for taxidermists) and tried to accurately capture the look of these delicate specimens that usually disintegrate once taken out of their native environment. The gorgeous creations were shelved and forgotten with the advent of photography, and later rediscovered and mended—nearly as fragile as the invertebrates they represent, displayed not just as other-worldly chandeliers and beautiful baubles but also studied as record (a novel sort of fossil) of the loss of biodiversity in the oceans over the ensuing century and a half.